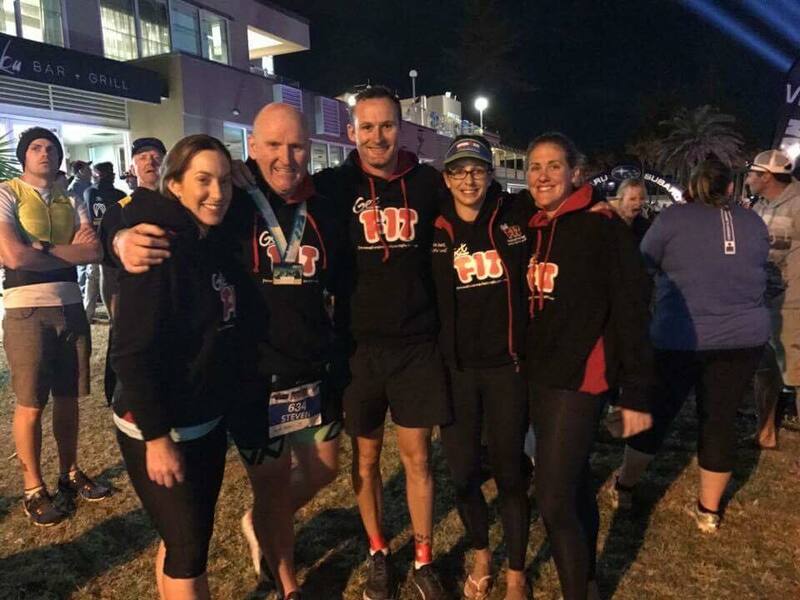 ​Port Macquarie was my first Ironman and what an experience it was! As I discovered when I got up there, it was a very challenging course, but the fantastic atmosphere made it perfect for me. Even when I was struggling, it was never long before I encountered someone with a kind word of encouragement. I can’t say everything went perfectly to plan, but I’m not really disappointed by that. Most of the other competitors I spoke to said something similar and having unexpected challenges rear their head during the race seems like an accepted part of ironman. Unlike the organisers of the Fyre Festival, being underprepared for an event or forgetting something really worries me so I repeatedly checked and re-checked all of my preparations the day before the race. Wide-eyed triathlon muggle that I am, I was pretty nervous the night before - the last time I had this much trouble sleeping was before my first ultra marathon. By 3AM. I was fully awake and there was no chance of getting back to sleep. I lay in bed restlessly, mentally ticking off my preparations and reminding myself I had a few things going in my favour. Steve the Bike Whisperer had double-checked my bike for me and the very knowledgeable and helpful Jason Allie from Get Fit Tas had gone over my race plan and everything was good to go. I also had a reasonable weather forecast and wasn’t carrying any niggling injuries so I had a heap of things going for me already. We got up before four and had an early breakfast, before doing some final checks and making our way down to transition. I loaded my bike up with food, and checked the tyres only to find that the Bike Whisperer had beaten me to it and they were ready. Then I made my way over to the starting area. The huge parking lot slowly filled with people as the darkness softened to morning light. 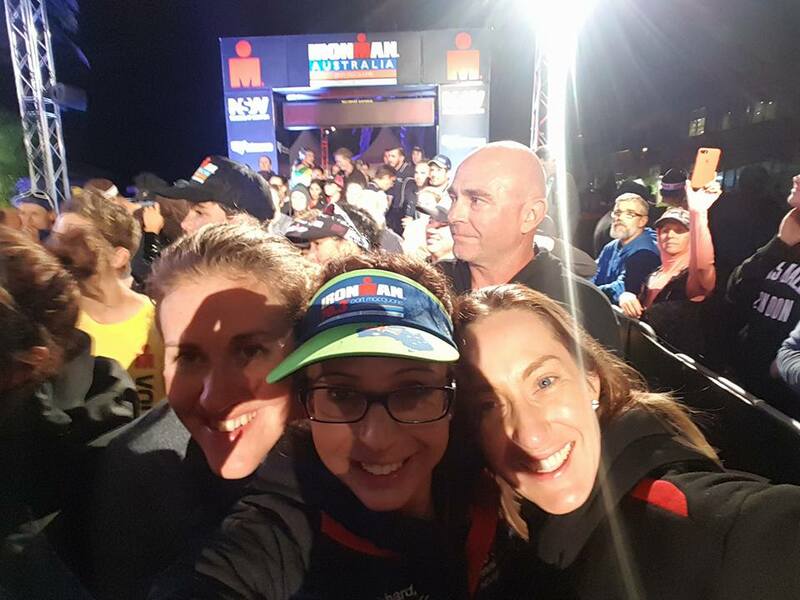 In little time, the first of the 70.3 athletes were hitting the water hard, swimming away quickly in the dawn half-light. With each few seconds more and more triathletes poured down the narrow ramp and surged out onto the course. Amongst them were Miranda, Ben and my lovely wife, each in the early stage of what were to be three impressive efforts. ​After the start of the 70.3, it was time to throw my wetsuit on and make sure I was ready. I walked anxiously to the starting gate with Janelle and Michael, whose calmness helped settle my nerves a little. The mass of swimmers were funnelled towards the narrow gate for the rolling start and almost before I was ready, it was my turn to step through the gate, splash down the ramp and dive into the warm water. Following the example of Australian foreign policymakers, I took off without a particularly clear idea of the exact plan, other than to follow along. We passed a number of sighting buoys and small boats and turned right at Pelican Island, before taking a hard left and entering a channel that cut inland. I wasn’t trying to swim too fast, just working at keeping a steady rhythm and concentrating hard on good (or at least better than my normal) technique. Unfortunately this was stymied by getting regularly caught behind slower swimmers and having to either pull up abruptly or surge forward and overtake when a gap presented. I got hit in the face by errant arms (but no lemon meringue pies so I was luckier than Alan Joyce) once or twice and jostled from the side by swimmers who (much like Corey Bernardi) were moving on a slightly different axis to the rest of us, but I could hardly get annoyed as I know I zigzag around a fair bit myself. The water around me darkened momentarily as I swam beneath the shadow of the bridge above and then I was back out in the sunshine. The low morning sun to my right was now bright and almost blinding when I breathed or tried to site. A few hundred metres after the bridge, we approached the weir crossing. I have never done a swim that crosses a weir before. Dare I say it, but it was something of a weird experience (sorry I know they shouldn't, but dad jokes make me laugh). The concrete wall loomed larger as I swam closer and swimmers around me converged towards the narrow set of steps we had to climb up. I awkwardly found my feet and climbed the steps feeling quite light-headed. I carefully made my way down the steps on the other side and dived out into the water once more. The water beyond the weir was cooler, which came as a relief at this point. Still zigzagging a little erratically, I continued to swim, following the splashing trail ahead of me. We reached the turning buoy a little quicker than I expected and were soon on our way back towards the weir. I am worse at siting than the captain of The Lake Illawarra at the best of times and half-blinded by the sunshine, I found it hard to keep a straight course. I had strayed a little far to the left (no surprise there for regular readers) and had to adjust my course as I approached the second crossing. I swam back under the bridge and turned right, following the shore towards the exit. The water got quickly shallower and shallower and my hands were sweeping through weeds at times, but rarely enough to obstruct my swimming. We passed the final marker, turned and swam to the exit ramp, running up out of the water, through the showers and following the path towards the transition area. ​I kept my speed down through the sharp turns and bumpy of the centre of town but as soon as I had got to the top of Clarence Street, I took off the handbrake and enjoyed the ride. The rolling hills on the way out of town got my legs moving and I felt great. After about ten kilometres, the hills began to flatten and I turned left onto the Cathie Straight, which was a long, flat section of bumpy road bordered on each side by the kind of tall vegetation Sean Spicer would hide behind. I looked at my Garmin for the first time in the ride about here and realised I was moving pretty quickly, certainly faster than I had planned. I deliberately tried to slow down a little and made sure I was storing plenty of energy for later. In planning for the race, I wasn’t sure what I was more worried about- going too hard early and burning out (what we might call ‘Rudding’) or not going hard enough to begin with and underachieving (that can only be called ‘Turnbulling’). I was trying to tread a fine line between the two, keeping my legs working reasonably hard but not doing anything that really put them under serious strain. It is pretty common knowledge that electrolytes and energy are really important in endurance racing- unless you are an anti-vaccer who thinks I am a paid shill for Big Pharma- so I had been fastidious about getting plenty of food and fluids into me in transition and during the early section of the ride. For this reason I was quite surprised to develop a sensation of tightness and pain in my stomach quite early in the ride. I consciously upped my food and drink intake a little more but it did little to alleviate the discomfort in my stomach. I really hadn’t counted on being hit with this type of problem this early in the race and spent a bit of time as I was riding trying to work out what had gone wrong. My best guess was that I had swallowed too much water in the swim and combining the silty water with the contents of my gut was as noxiously stomach-churning as combining Mark Latham and David Leyjonhelm under one political party. Whatever the cause, there was little I could do about it, so I put my head down and kept riding. After Lake Cathie there were a couple more sharp climbs and fast descents, with the downhill after Bonnie Hills particularly steep, but the road was still mainly flat. On the uneven surface I was rattling around violently on the downhills, which was a little frightening, but I gritted my teeth and resisted the urge to use the brakes. We turned left off the highway near Laurieton and followed a quieter section of the road past mangrove swamps and a few lakeside houses. After nearly 45 kilometres I turned around a circle of traffic cones and was on my way back. The volunteers at the aid stations were absolutely amazing. I cannot overemphasise that. I made sure I used every station and the friendly encouragement and efficient assistance offered every time was fantastic. My decision to conserve energy when it had seemed plentiful (lessons learnt from the failures of Hydro Tasmania in recent years) seemed to be paying dividends, as my legs felt really strong at this point. However, my stomach was still pretty painful. Thankfully I was able to eat and drink without much discomfort and it wasn’t really affecting my riding, so I put it to the back of my mind. The back half of the first lap felt surprisingly good. I distrust loose gravel as much as Kellyanne Conway distrusts microwaves, so I slowed dramatically when crossing a strip of it near Lake Cathie. I also had to work hard on a couple of the climbs, but other than that felt fairly comfortable. I occasionally passed a cyclist stopped at the roadside dealing with some kind of mechanical issue. After my experience in the Coles Bay 70.3, I had a lot of sympathy for this and every time I passed I said a silent atheist’s prayer (one that I know doesn’t reduce the likelihood of mechanical failure) that it wouldn’t happen to me this time. After a little more than 80km, I turned back onto Mathew Flinders Drive and mentally set myself for the hills to come. After a long undulating stretch past the beach, the road turned sharply to the left and hit a shockingly steep hill that climbs for around 100 metres (could have been less but it felt like a lot more). I hit the hill and was quickly into my lowest gear. Soon I was out of the saddle and grinding my way through the steepest part of the climb. The hill, itself, was full of activity and energy. There were a number of cyclists battling it at the same time and hundred of spectators standing either side of the road, cheering and chanting encouragement as we climbed. Despite the hard work, I kind of enjoyed it. The top section of the hill flattens slightly and I was able to return to my normal, less tiring cycling position. After reaching the top of Mathew Flinders, the course climbed gently higher for another kilometre before turning right onto Pacific Drive (the road, not the ‘90s TV show). From here it was just a short stretch of hills leading back to town. I turned for the second lap and headed back along Clarence Street, which was lined with cheering spectators (unlike this photo which I took the day before). I saw Aimee, my Race Mum (not sure if she will appreciate that name but I’m rolling with it), who gave me a big cheer and then added a reminder to drink lots of water as I passed. I powered through the hills on my way out of town, still feeling pretty good apart from the stomach pains. Although I felt like I was still putting the same amount of effort in, I did notice I was moving a little slower on the flat sections of this lap. I was also becoming aware of some serious pain in my toes from constantly bumping against the end of my shoe. The climbs towards the back of the course were much slower this time around but I stuck at them doggedly. It was a bit less crowded on the road by now, with cyclists spread all over the course so I didn’t have to worry about overtaking or being overtaken as much, although occasionally someone would absolutely race past me so quickly I couldn’t quite believe they had been behind me for so long. The road vibrations continued to hammer my feet. Without any exaggeration, it felt like several of my toes were broken and I dreaded looking at them when I got off the bike. Things really started getting tough on the way back. Despite my earlier optimism and pacing, my legs now felt as fresh as a piece of fruit from Coles. My back was also aching and it was hard to maintain an aerodynamic position for long. While most of the way back was tough, I really started to fall apart with 20k to go. Everything from here was a battle and could feel pinches of tightness in my legs as they threatened rebellion more often than George Christenson. I approached the bend of Matthew Flinders Drive and remember thinking, “I now need to get through the hills again and then run a marathon. That is crazy- what am I doing?” I felt my heart rate start to race just thinking about the challenge that still lay ahead, but stuffed it back down as the immediate challenge of the steep hill re-emerged. The second time up Matthew Flinders was a lot harder and not at all fun. There were still plenty of supporters giving encouragement and in one of the best bits of thematic music I encountered throughout the day Fanfare for the Common Man was playing on some nearby speakers. I groaned my way to the top, terrified at any time that my quads would cramp, but thankfully they held together and I was soon easing my way over the final hills and rolling back into town. Race Mum and my wife were both waiting as I approached transition, which gave me another boost and I was quickly off my bike, which was whisked away by another amazing volunteer, and running through the racking area to the transition tent. I had told myself I would take my time in transition, but my adrenaline was up and I rushed more than I should have. I am usually quite comfortable eating whilst running, so I didn’t bother to try to eat anything whilst I was getting changed. As far as oversights go this wasn’t exactly Michealia Cash forgetting to declare a $1.4 million investment property, but it was a bad one nonetheless. I had a look at my aching toes and was cheerfully surprised to find little obvious bruising or broken skin, so I threw my runners on as a helpful volunteer stuffed a few bandaids into my back pocket. I had thought about throwing on an iPod at this time in the race, but I am still waiting on some new headphones Cassie Sainsbury was bringing me back from overseas (chill out, AFP, it’s a joke) so I was relying on the music and encouragement along the course. Soon enough I was crossing the start line for the run and jogging out onto the course. As Abbott and Hockey found in their first budget, it is easy to get carried away with your enthusiasm and go too hard too early, so I was especially careful not to let my adrenaline drag me along until I had found a rhythm and worked out how my body was actually feeling. I was assuming the major issues would come from my calves and feet, but quickly realised I had a more immediate problem. The stomach pains I had been experiencing whilst riding were exacerbated by the motion of running, making breathing painful and eating almost impossible. The two energy bars in my back pocket had just been made redundant quicker than James Comey! Moving awkwardly, I jogged my way out along the water’s edge and up towards Observatory Hill. Even with my discomfort, this was a great part of the run, with the beach below me looking amazing and thronging supporters close by on either side of the course giving plenty of encouragement. Cowbells, horns and cheering filled the air in the bright sunshine. From the hill, I took a sharp left turn downhill past the second aid station and back along the break wall. Numerous supporters were perched on the brightly-painted stones to my right, and all manner of elaborately costumed creatures including a seven-foot tall Elmo and a couple of dinosaurs came out of the tent city to my left to give us encouragement as we ran past. I’ve had stomach pains whilst running plenty of times before and usually they disappear pretty quickly. But this time was different. Like housing affordability, this was a problem that was getting worse not better. I felt another mini panic attack rising inside me. This wasn’t how I had envisaged my run leg. I was prepared for heavy legs and a struggle for every kilometre, but I knew I could keep going through all of that. This shortness of breath and abdominal pain wasn’t just uncomfortable now, it was also really worrying as I considered how I would feel in a few hours’ time. I was feeling pretty despondent as I ran back past transition and headed out along the road. The enormity of how much there was still to go and the realisation that it was likely going to be worse than the first few kilometres threatened to overwhelm me but I found a way to hang tough. I had known coming in that it would be a hard day and I had reminded myself before the race that I had made a commitment to live my life with greater courage. The back half of the run leg followed a flat stretch of road to Settlement Point. I turned with some relief to be on my way to finishing the first lap. As I said about the Melbourne Marathon, I usually prefer a single loop course to keep things interesting, but I was really glad today’s course was four laps. It made it much easier to break into manageable segments. Even in as much distress as I was, I knew I could run one lap, so that was all I focused on at the time. I was struggling to use aid stations to even drink much. I had expected to really take advantage of these, as I normally eat on the run very comfortably. However, my attempts to eat in the first lap were as vomit-inducing as hearing Peter Dutton espousing Australian values, so I eventually gave up eating aside from the occasional pretzel- and obviously plenty of water. The second lap felt really tough but I told myself at the end of the lap I’d be at half way there and if that was good enough for Bon Jovi it was good enough for me, so I kept battling on. At about 16km, the realisation that I was approaching the half marathon allowed me to accept that I really was going to make it. As I relaxed a little, my breathing actually became a little easier and running became slightly more comfortable. Dropping into a smoother running pace I rediscovered my smile and enjoyed (kind of) the rest race. My day brightened further when Jason and Race Mum appeared alongside me on bikes and chatted to me for a while. There was something reassuring about their confidence that even without eating in the last few hours I wasn’t going to come to a shuddering halt as long as I kept my water and electrolytes up. As a result, I hit the third lap with renewed spirits. As I ran back along the break wall for the third time, the sun was setting across the water and I was able to enjoy the expansive pink sunset. I was running a fair bit quicker than I had for the first two laps and feeling not too bad. My guts were still hurting but weren’t getting any worse, which meant I could ignore them. I was tempted to run faster still, but decided to wait for the final lap and see how I was feeling then. ​The final lap was in the dark and the course had become very crowded with other runners, so I had to be a bit careful. I smiled in appreciation at the supporters who were still standing by the track as I ran up the hill for the final time. My wife was waiting near the bridge with Race Mum and they were both cheering like crazy from the moment I came into view. Conscious that it really didn’t convey just how much I appreciated seeing them, I gave a tired wave and smile, got a high five from Riley and ran on, now focused on getting to the end. I hit Settlement Point for the last time and could finally say I was heading for home. It was quiet at this end of the course but the closer I got to the finish the louder and more vibrant the atmosphere became. Great moving beams of light shot up into the sky from just next to the finish line and beckoned me from kilometres away. With about four kilometres to go I accelerated again, racing back towards the end at a faster speed than I had run for the whole race. The brightly lit finishers’ chute opened ahead of me and the roar of the crowd was thunderous. I let myself slow to enjoy the final moments, high fiving people as I ran past and waving to my wife, Race Mum and Miranda. With the last few steps I ascended a short ramp and to paraphrase Black Sabbath (sorry nerds they said it better than Robert Downey Jnr) I was Ironman (for all results go to this link). It was a thoroughly unforgettable experience and one that meant a lot to me. I wrote a few days before the event that I was quite scared, but that I was heartened by the huge amount of support I had received from friends and family, and by the enduring legacy of two wonderful friends and these things made a significant difference in the hard times of the race. I am incredibly grateful to the organisers and the amazing volunteers who I could not praise enough, as well as all the spectators who come out and encouraged the athletes. I also have to make another special mention to Race Mum, Coach Jason, the Bike Whisperer and of course my wonderful wife for all the advice and support they gave helping me get to the starting line, and then to the finish line.